I previously wrote a post on the tools panel in Flash CS4. 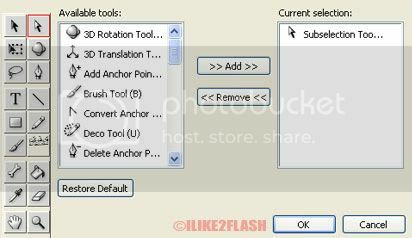 In this post I will show you how to customise the tools panel in Flash CS4. Customising the tools panel can involve rearranging the tools to different locations, or removing the tools you don’t use. To customise the tools panel, you need to go to Edit > Customise Tool panel from the menu bar. The following window should appear. You now select the tool you want to modify on the left side of the window. The selected tool will appear in a red outline. If you want to add another tool to the current selection, simply choose the tool and hit the ‘Add’ button. You can add as many other tools to the selection as you wish. If you want to remove a tool from the tools panel, you select the tool and hit the ‘Remove’ button. This will leave an empty space on the tools panel as shown below. To return the tools panel back to the default settings. You can select the ‘Restore Default’ button which will revert back to the default.